Grand Teton National Park is one of the 10 most visited national parks in the USA. It receives 2.5 million visitors each year. The iconic feature of this park is 40 mile long Teton Range. It is the youngest range in the Rocky Mountains. This 310,000 acre park is located in the state of Wyoming’s northwest region. It is 16 kilometers south of the Yellowstone National Park. 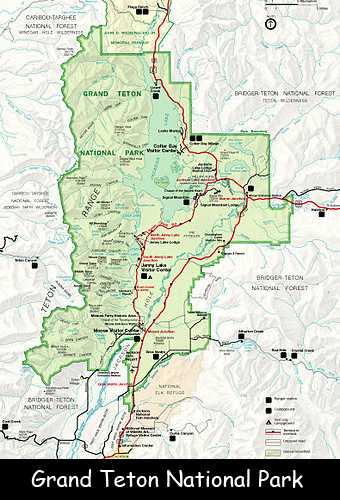 The park includes the major peaks of the 64 kilometers (40 miles) long Teton Range as well as most of the northern sections of the valley known as Jackson Hole. Grand Teton is the highest mountain in this national park. It measures 4,199 meters above sea level. Grand Teton National Park was established in 1929 by President Calvin Coolidge. At that time, it covered an area of 96,000 acres. This Park’s elevation ranges from 6.400 feet to 13,775 feet. The Teton Range is largely made up of extremely old Precambrian metamorphic rocks that are known as gneiss. There is a commercial airport on the park grounds. It is the only national park in the US with a commercial airport. There are a total of 12 glaciers in the park’s peaks. Teton Glacier is the largest of all of them. In 1929, President Calvin Coolidge went against enormous public opposition and approved this national park. The park is home to plenty of wildlife which includes: Wolves, Bison, Coyote, Moose, Bighorn Sheep, Pronghorn, Grizzly Bears, Black Bears. It has 242 miles of hiking trails. Declan, Tobin. " All Facts for Kids about Grand Teton National Park ." Easy Science for Kids, Apr 2019. Web. 18 Apr 2019. < https://easyscienceforkids.com/grand-teton-national-park/ >.